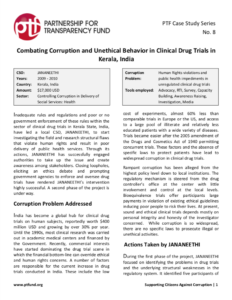 Inadequate rules and regulations and poor or no government enforcement of these rules within the sector of clinical drug trials in Kerala State, India, have led a local CSO, JANANEETHI, to start investigating the field and research structural flaws that violate human rights and result in poor delivery of public health services. Through its actions, JANANEETHI has successfully engaged authorities to take up the issue and create awareness among stakeholders. Closing loopholes, eliciting an ethics debate and prompting government agencies to enforce and oversee drug trials have rendered JANANEETHI’s intervention highly successful. A second phase of the project is under way.